For most of your customers, your website is the first glimpse of your product or service and your brand offering. Your message needs to be delivered clearly, assuring that you create interest and establish credibility while meeting your business goals and the goals of your users. High-end aesthetics spark desire. Coupling that with clear messaging, amazing layout, and meaningful content, we’ll represent you and your brand in the best light possible. No matter the extent of your features or your content, without good design and strategic messaging, your functionality and content can be lost. We optimize for usability, speed, SEO, and partnering with you to design slick and organized website UI that creates a frictionless experience. Your visitors will spend only split seconds thinking about how to navigate, allowing them to focus solely on your message, the value of your calls to action, and the engagement of your brand. Do you feel like your website is not supporting your organization’s goals? Have your customers complained that it’s difficult to find the information they need on your site? Is your database too cumbersome for your staff? Are your online marketing efforts falling below your expectations? 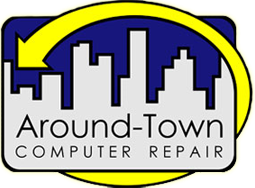 If you answered yes to any of these questions, it’s time to call Around-Town Computer Repair. Call 559-589-9100 today to schedule a consultation!